Background: Osteoporosis is the most common metabolic bone disease. The study's objective is to investigate the effect of an educational program based on Health Belief Model (HBM) on preventing osteoporosis in women. Methods: In this quasi-experimental study, 120 patients (60 experimental and 60 control) who were registered under the health centers in Fasa City, Fars Province, Iran, were selected in 2014. A questionnaire consisting of demographic information, HBM constructs was used to measure nutrition and walking performance for the prevention of osteoporosis before, immediately after intervention, and 6 months later. Bone mineral density (BMD) was recorded at the lumbar spine and femur before and 6 months after intervention. Results: The mean age of women participated in the study was 41.75 ± 5.4 years for the experimental group, and 41.77 ± 5.43 years for the control group. The mean body mass index was 22.44 ± 3.30 for the experimental group and 22.27 ± 3.05 for the control group. The average number of women deliveries for the experimental group was 2.57 ± 1.47 and 2.50 ± 1.19 for the control group. There is no significant difference between the two groups in education level (P = 0.771), marital status (P = 0.880), occupation (P = 0.673), breastfeeding (P = 0.769), smoking (P = 0.315), history of osteoporosis in the family (P = 0.378), history of special diseases (P = 0.769), and records of bone densitometry (P = 0.543). Immediately and 6 months after intervention, the experimental group showed a significant increase in the knowledge, perceived susceptibility, perceived severity, perceived benefits, perceived barriers, self-efficacy, internal cues to action, nutrition, and walking performance compared to the control group. Six months after intervention, the value of lumbar spine BMD T-score in the experimental group increased to 0.127, while in the control group it reduced to −0.043. The value of the hip BMD T-score in the intervention group increased to 0.125, but it decreased to −0.028 in the control group. Conclusions: This study showed the effectiveness of knowledge, walking, and diet on bone mass by HBM. Hence, these models can act as a framework for designing and implementing educational interventions for the osteoporosis prevention. Perceived susceptibility was used to evaluate women's perception about the extent to which they are at risk of osteoporosis. Also, their perceived severity of osteoporosis complications was measured. The sum of these two factors is the women's perceived threat of the disease. 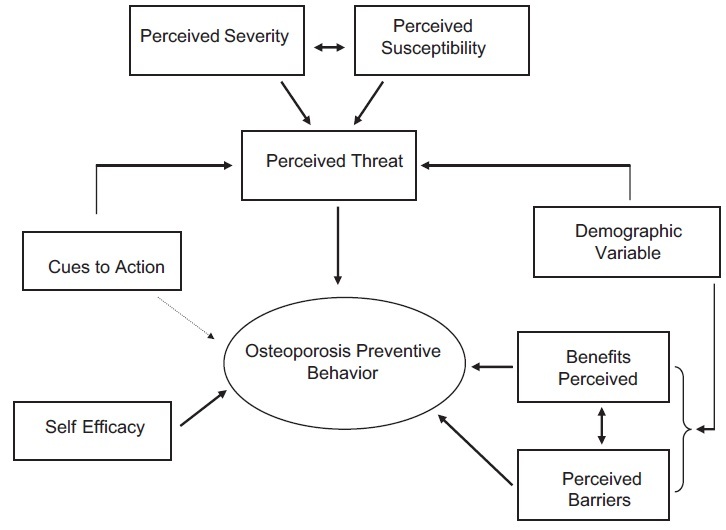 The perceived benefits and barriers that refer the individual's analysis about the benefits of adopting preventive behaviors of osteoporosis such as diet and walking and about potential barriers to preventive behaviors of osteoporosis were investigated. These, alongside women's perceived ability to carry out preventive behaviors, their cues to action (the incentives that affect women within and outside the family such as friends, doctors, healthcare providers, media, and educational resources), their fear of osteoporosis complications, and their sense of inner peace as a result of seeking preventive behaviors are factors affecting women's decision to comply with preventive behaviors of osteoporosis. Considering what said above, this study aims to measure HBM constructs regarding eating behaviors and physical activity on bone density in the prevention of osteoporosis among women. The study was a quasi-experimental, prospective intervention research in 2014. The population of this study includes 120 women 30-50 years old covered by health centers of Fasa, Fars Province, Iran (60 intervention group and 60 control group). Among the six Urban Health Centers of Fasa, two centers were randomly selected that a center for the experimental group and another center for the control group. Simple random sampling was used at health center based on the numbers of health records of the mothers covered by the centers. The subjects were then invited to a meeting in a health center. They were explained about the study and the related purposes and their written informed consents were obtained. Women 30-50 years old covered by Health Centers of Fasa, lack of rheumatoid disease and mental illness, lack of fractures, and consent to participate in the study. Women with disability, diseases, and problems (such women with genetic early osteoporosis) that prevented them from participating in the study were excluded. [Figure 1] presents the flowchart of study participants. After selecting the experimental and control groups, the pretest questionnaire was administered to two groups. These people were present from the beginning to the end of the study. Women's education by researchers and five public health experts was done. Training sessions were held in the Hall Health Center. Participants did not know whether or not they are affected by osteoporosis. Next, to measure bone density, the subjects were sent to Fasa bone densitometry center. After testing, the results were recorded. Bone density was measured by Hologic machine using dual energy X-ray absorptiometry method in L1 to L4 bones. The densitometry data including bone density in the lumbar spine and femoral neck was collected based on the WHO's T-score values. The intervention for the experimental group included eight educational sessions of 55-60 min of speech, group discussion, questions and answers, as well as posters and educational pamphlets, film screenings, and PowerPoint displays. The details of the training sessions were as follows. First session: Introduction to osteoporosis and its signs, complications, and diagnosis. Second session: A 55-year-old woman who was diagnosed with osteoporosis and had a fracture was invited to show as a model and talk to the subjects about osteoporosis and its risk factors, symptoms, complications, and diagnosis with the help of a physician. Third and fourth sessions: The role of nutrition in preventing osteoporosis, benefits, and barriers of diet, following dietary recommendations, self-efficacy in observing proper diet, and activities were recorded in specified forms. Fifth and sixth sessions: The role of exercise, appropriate exercises, the role and importance of walking, benefits and barriers to walking, types of waking, self-efficacy in walking, and recording the duration of walking in specified forms were considered. Seventh session: The session was held in the presence of at least one family member, and the role of family members in making, facilitating, and providing suitable food, walking program, and BMD testing was explained. Eighth session: The previous sessions were reviewed, and the subjects were provided with educational pamphlets. Immediately after intervention, both groups completed the questionnaire. To preserve and enhance the activity of the experimental group, weekly educational text messages about osteoporosis were sent to them, and they attended monthly training sessions so that the researchers can follow-up their activities. Six months later, the questionnaire was completed by both groups (experimental and control), and the subjects underwent BMD tests, and the results were recorded. The researchers of this study after study texts and also with observing the principles of design tools data were designed and developed tool. In a cross-sectional study, 401 women between 30 and 50 years old who were covered by Health Centers of Fasa, to design and evaluate the reliability and validity of data collection tools were studied. The first part includes demographic questions, including age, body mass index (BMI), education level, marital status, occupation, times of delivery, breastfeeding, smoking, history of osteoporosis, history of osteoporosis in the family, history of a special disease (any disease other than osteoporosis, such as thyroid disease, diabetes, cancer, and immunodeficiency diseases), and history of BMD. The second section includes questions on structures of the HBM. , Questions include: Twenty three questions on knowledge; 4 questions on perceived susceptibility (the women's opinion about chances of getting osteoporosis); 6 questions on perceived severity (about complications due to osteoporosis); 8 questions on perceived benefits (about the benefits of preventive behaviors of osteoporosis, such as physical activity and calcium intake); 7 questions on perceived barriers (including barriers to physical activity and consumption of calcium-rich foods), 4 questions on self-efficacy (including the ability to do exercises and observe proper diet); 1 question on external cues to action (resources including family and friends, doctors and health workers, mass media, books and magazines, internet and other patients with osteoporosis that encourage the subjects toward prevention behaviors of osteoporosis); and 3 questions on internal cues to action (including the fear of suffering from complications of osteoporosis and a sense of inner peace following preventive behaviors); all questions are based on the standard 5-point Likert scale ranging from strongly disagree to strongly agree (scores of 1-5). Scores of questions on external cues to action are calculated as cumulative frequency. The third section consists of questions on nutritional performance and exercise, that is, walking. The performance questions consist of 10 questions about the type and amount of food consumed during the past week (score from 0 to 14). The exercise questions include 7 questions on the duration and type of walking (easy, moderate, and heavy) during the last week based on received guidelines (score from 0 to 21). The subjects' performance was assessed via self-report method. To evaluate the validity of the questionnaire items, the item effect size higher than 0.15 and content validity ratio (CVR) above 0.79 were considered and based on the exploratory factor analysis, they were classified into nine factors. To determine face validity, a list of the items was checked by 30 women of 30-50 with demographic, economic, social, and other characteristics similar to those of the targeted population. To determine the content validity, 12 specialists and professionals (outside the team) in the field of health education and health promotion (n = 10), orthopedic (n = 1), and biostatistics (n = 1) were consulted. Then, based on the Lawshe's table, items with higher CVR value (than 0.56 for 12 people) were considered acceptable and were retained for subsequent analysis. The calculated values in this study for the majority of items were higher than 0.70. To determine reliability, a list of the items by 30 women of 30-50 with demographic, economic, social, and other characteristics similar to those of the targeted population in two consecutive 20-day periods was completed. The overall reliability of the instrument based on the Cronbach's alpha was 0.87. Cronbach's alpha was 0.86 for knowledge, 0.71 for perceived susceptibility, 0.82 for perceived severity, 0.79 for perceived benefits, 0.82 for perceived barriers, 0.79 for self-efficacy, and 0.77 for cues to action. Since the alpha values calculated for each of the structures studied in this research were higher than 0.7, the reliability level of the instrument was considered acceptable. The conceptual framework of the proposed model is illustrated in [Figure 2]. Ethical considerations performed by obtaining from the ethics committee of Tarbiat Modares University. The aims and importance of the study were explained to the subjects, and their written consent was obtained. The participants were assured that the information would remain confidential. Data analysis was carried out through SPSS 19.0 software package (SPSS Inc., IBM, Chicago, IL, USA). using the Chi-square test, independent t-test, Mann-Whitney, and repeated measurement ANOVA. Demographic variables were compared between two groups with the Chi-square test. Comparison between the constructs of HBM, nutrition performance, and jogging performance during the time was done with repeated measurement ANOVA, followed up with Bonferroni post-hoc test separately in groups. Constructs of HBM, nutrition performance, and jogging performance were also compared between two groups with an independent t-test. T-score of lumbar spine and femur were compared between groups with Mann-Whitney nonparametric test according to departed of the normal distribution. Significance level was 0.05. Based on the results, the mean age of women participated in the study was 41.75 ± 5.4 years for the experimental group and 41.77 ± 5.43 years for the control group. The mean BMI was 22.44 ± 3.30 for the experimental group and 22.27 ± 3.05 for the control group. The average number of women deliveries (number of pregnant women) for the experimental group was 2.57 ± 1.47 and 2.50 ± 1.19 for the control group. In terms of menopause and birth control-estrogen use, calcium of Vitamin D supplements not show a significant difference between the two groups. The above parameters did not show a significant difference between the two groups based on the independent t-test. [Table 1] shows the demographic data. Based on the Chi-square test, there is no significant difference between the two groups in education level (P = 0.771), marital status (P = 0.880), occupation (P = 0.673), breastfeeding (P = 0.769), smoking (P = 0.315), history of osteoporosis in the family (P = 0.378), history of special diseases (P = 0.769), and records of bone densitometry (P = 0.543). The results showed that before intervention, there was no significant difference between the two groups in terms of knowledge (P = 0.358), perceived susceptibility (P = 0.827), perceived severity (P = 0.196), perceived benefits (P = 0.707), perceived barriers (P = 0.293), self-efficacy (P = 0.965), internal cues to action (P = 0.262), nutrition (P = 0.481), and walking performance (P = 0.999). However, immediately after intervention and 6 months later, the experimental group showed a significant increase compared to the control group in all of the foregoing scales except for perceived barriers (P < 0.001). 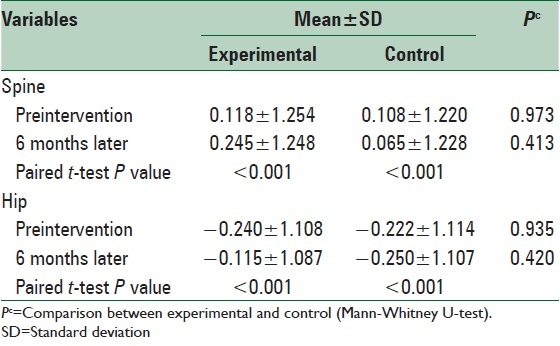 On structural barriers, the experimental group showed a significant decrease compared to the control group [Table 2] and [Table 3] (P < 0.001). Comparison of BMD T-score in the lumbar spine (P = 0.973) and femur (P = 0.935) in women before and 6 months after intervention showed that before intervention, there was no significant difference between the experimental group and the control group in this regard. Six months after intervention, the value of lumbar spine BMD T-score in the experimental group increased to 0.127, while in the control group it reduced to −0.043 (P = 0.413). The value of the hip BMD T-score in the intervention group increased to 0.125, while it decreased to −0.028 in the control group (P = 0.420) [Table 4]. [Table 5] shows the distribution of external cues to action for osteoporosis, before, immediately after, and 6 months after intervention. The number of cues used, especially family and friends, immediately after intervention and 6 months after intervention increased as compared to before intervention. This study showed that a key prevention method for osteoporosis is that of community-based intervention strategies using behavior change models such as the HBM. Based on the results, there were significant differences between mean scores of knowledge before, immediately after, and 6 months after intervention in the experimental group. The knowledge scores in this group increased significantly after intervention. This is consistent with results of Ghaffari et al.,  Winzenberg et al.,  and Al Seraty and Ali Wafaa. Although the mean score of knowledge significantly increased in the control group as well, there is a significant difference between the mean scores of knowledge for the two groups. The increase in knowledge and other constructs can be the participants' access to information as well as their participation in the training course held by the Fasa Health Center about diseases and health issues for women and health volunteers. The increase in knowledge score in the intervention group is significant and deserves consideration. There was a significant difference between perceived susceptibility of the two groups 6 months after intervention. This can be attributed to the effects of intervention on the subjects perceived susceptibility. In other words, after intervention, most women believed they were at risk for osteoporosis. This is consistent with results of Tussing and Chapman-Novakofski,  Doheny et al.,  and Ghaffari et al. After intervention, the perceived severity of the experimental group significantly increased compared to the control group. This is consistent with results of Khorsandi et al. and Hazavehei et al. However, the perceived severity in Tussing and Chapman-Novakofski  and Hormoz et al. showed no significant increase after intervention. The mean scores for perceived benefits showed a greater increase in the experimental group than in the control group immediately after and 6 months after intervention. Azar et al. showed that the construct of perceived benefits of physical activity in the intervention group significantly increased after training, but this was not true for the control group. This is consistent with the findings of the present study. In the study by Beik on the prevention of osteoporosis among women with low socioeconomic status, perceived benefits showed a significant increase after intervention. The increase in the perceived benefits can be the result of an emphasis in training on walking and diet, physical and psychological benefits of walking, and the role of nutrition in preventing osteoporosis. The results of this study showed no significant difference between the two groups before intervention in terms of barriers. However, the difference was significant in immediately and 6 months after intervention for the experimental groups. In other words, the educational interventions significantly reduced barriers to proper diet and walking, thereby reducing the risk of osteoporosis. In the study of Anderson et al. and Khorsandi et al.,  perceived barriers of the study population regarding calcium intake and physical activity decreased after intervention. 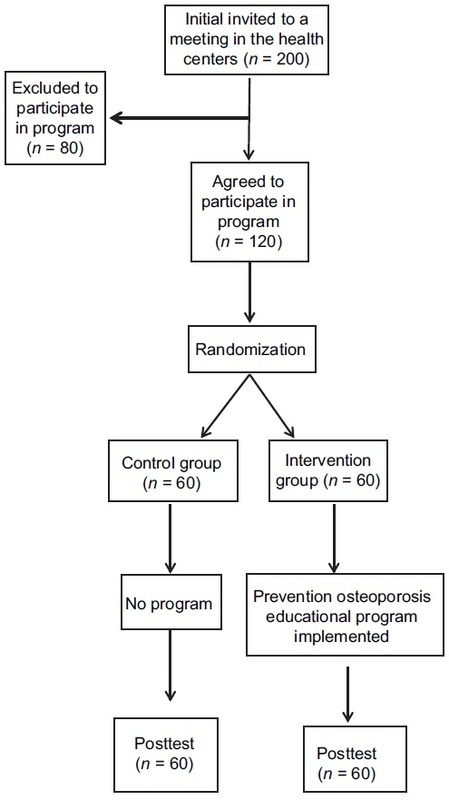 The results show the effectiveness of the intervention program and the importance of educational interventions to improve osteoporosis prevention behaviors. Results of the education based on the HBM showed that people with higher mean scores on these constructs performed better in activities for the prevention of osteoporosis and had better bone density. The limitations related to this research include its sampling method. Simple random sampling is selecting research participants on the basis of being accessible to the researcher. Another concern about such data centers on whether subjects can accurately recall past behaviors. Cognitive psychologists have warned that the human memory is fallible, and thus the reliability of self-reported data is tenuous on some items. The exercise questions only related to walking, which may not have a big impact on bone density. The results of this study, the importance of ongoing investigations, epidemiology and education about osteoporosis in women reveal that policy makers should consider health-related field as a priority. The results of this study showed that health can enhance the knowledge, perceived susceptibility, understanding the risks of disease, and interests and obstacles to the proper conduct of the preventive role. Most importantly, but it seems to change behavior, especially long-term behaviors and the behaviors that socioeconomic factors are interdependent, and failure. To sort these issues, should also be considered. It can be concluded from the results of this study that providing educational programs in this regard for family members, physicians, and other health personnel and offering training programs in radio and television broadcasting is essential. Further studies should have more comprehensive interventions on the structures of calcium intake benefits and barriers and use other behavioral change theories. It is advised that researchers explain social and behavioral barriers in calcium intake in different cultural contexts. Adachi JD, Adami S, Gehlbach S, Anderson FA Jr, Boonen S, Chapurlat RD, et al. Impact of prevalent fractures on quality of life: Baseline results from the global longitudinal study of osteoporosis in women. Mayo Clin Proc 2010;85:806-13. Boot AM, de Ridder MA, Pols HA, Krenning EP, de Muinck Keizer-Schrama SM. Bone mineral Density in children and adolescents: Relation to puberty, calcium intake, and physical activity. J Clin Endocrinol Metab 2008;82:57-62. Prevention Disease Office, Ministry of Health and Medical Education. Guid to Diagnosis, Prevention and Treatment of Osteoporosis. Tehran: Pub Centered Prevention Disease; 2009. Irani AD, Poorolajal J, Khalilian A, Esmailnasab N, Cheraghi Z. 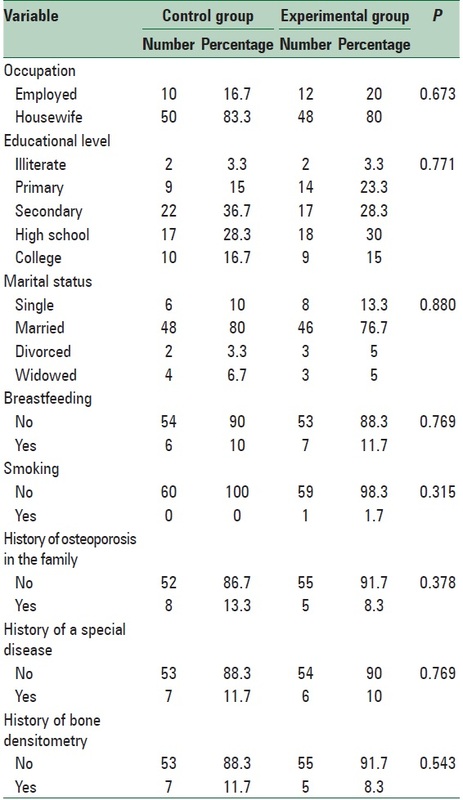 Prevalence of osteoporosis in Iran: A meta-analysis. J Res Med Sci 2013;18:759-66. Khani Jeihooni A, Hidarnia AR, Kaveh MH, Hajizadeh E, Heydarabadi AB, Motlagh BF, et al. Prevalence of osteoporosis and its related factors in women referred to Fasa's densitometry center. Sci J Ilam Univ Med Sci 2013;21:150-8. Mahboub SM, Al-Muammar MN, Elareefy AA. Evaluation of the prevalence and correlated factors for decreased bone mass density among pre- and post-menopausal educated working women in Saudi Arabia. J Health Popul Nutr 2014;32:513-9. Sedlak CA, Doheny MO, Estok PJ, Zeller RA. Tailored interventions to enhance osteoporosis prevention in women. Orthop Nurs 2005;24:270-6. Ghaffari M, Tavassoli E, Esmaill Zadeh A, Hasan Zadeh A. The effect of education based on health belief model on the improvement of osteoporosis preventive nutritional behaviors of second grade middle school girls in Isfahan. J Health Syst Res 2011;6:1-10. Al Seraty WH, Ali Wafaa GM. The impacts of health belief model based intervention for osteoporosis prevention among female students in Al Dawadmi applied medical science, Shaqraa University, Saudi Arabia. J Biol Agric Healthc 2014;4:125-31. Doheny MO, Sedlak CA, Hall RJ, Estoke PJ. Structural model for osteoporosis preventing behavior in men. Am J Men Health 2011;6:25-32. Khorsandi M, Shamsi M, Jahani F. The effect of education based on Health Belief Model about prevention from osteoporosis among pregnant mother refer to Arak health centers. Danshvar Pezeshki J Shahed Univ 2011;18:1-10. Hormoz SN, Reza T, Asma F, Ali Akbar KZ, Zahra HA. The effect of educational intervention with the health belief model on knowledge, perceptions and self-efficacy among adolescent of high school girls about osteoporosis, Tehran, Iran 2010-2011. J Urmia Univ Med Sci 2013;24:163-9. Azar FE, Solhi M, Zohoor AR, Ali Hosseini M. The effect of health belief model on promoting preventive behaviors of osteoporosis among rural women of Malayer. JQUMS 2012;16:58-64. Beik AM. The effect of education on knowledge, attitude and practice of women clients of Imam Khomeini Relief Foundation in one Isfahan province related to the preventive behavior of osteoporosis using the health belief model. J Epidemiol Specializes Iran 2010;7:30-7. Kaveh MH, Golij M, Nazari M, Mazloom Z, Rezaeian Zadeh A. Effects of an osteoporosis prevention training program on physical activity-related stages of change and self-efficacy among university students, Shiraz, Iran: A Randomized Clinical Trial. J Adv Med Educ Prof 2014;2:158-64. Wu F, Laslett LL, Wills K, Oldenburg B, Jones G, Winzenberg T. Effects of individualized bone density feedback and educational interventions on osteoporosis knowledge and self-efficacy: A 12-yr prospective study. J Clin Densitom 2014;17:466-72. Tarshizi L, Anousheh M, Ghofranipour FA, Ahmadi FA, Hoshyarrad A. The impact of education based on health belief model on the use of preventive factors of osteoporosis in postmenopausal women. J Nurs Midwifery Iran Univ Med Sci 2009;22:71-82. Davoud S, Roya RS, Javad TM, Mojgan A, Behnam L. Application of health belief model in prevention of osteoporosis in volunteers of Khorramabad City health centers, Iran. J Health Syst Res 2012;8:183-92. Plawecki K, Chapman-Novakofski K. Effectiveness of community intervention in improving bone health behaviors in older adults. J Nutr Gerontol Geriatr 2013;32:145-60. Huang CM, Su CY, Chien LY, Guo JL. The effectiveness of an osteoporosis prevention program among women in Taiwan. Appl Nurs Res 2011;24:e29-37. Zhao J, Lin Z, Tian Y. Effects of 6 month of Tai Chi Chuan, with and without calcium supplementation, On bone health in female aged 50-59 years. J Exerc Sci Fit 2007;5:88-94.